Smokin’ Hot … New Website!!! Hello Crafty Friends! Welcome to my new website! I’m so excited to have a new beautiful blog to share my creative projects with you all. I want to thank my boyfriend Kris for building me this site and making it look even more awesome than I imagined. Thank you so much and I love you Babe! If you are not already following my blog, please follow using Google Friend Connect or NetworkedBlogs. If you previously subscribed by email, please subscribe again using the link in the sidebar. Thank you so much. I really appreciate all your support and comments!!! You all mean a lot to me. Ok, now on to the card. 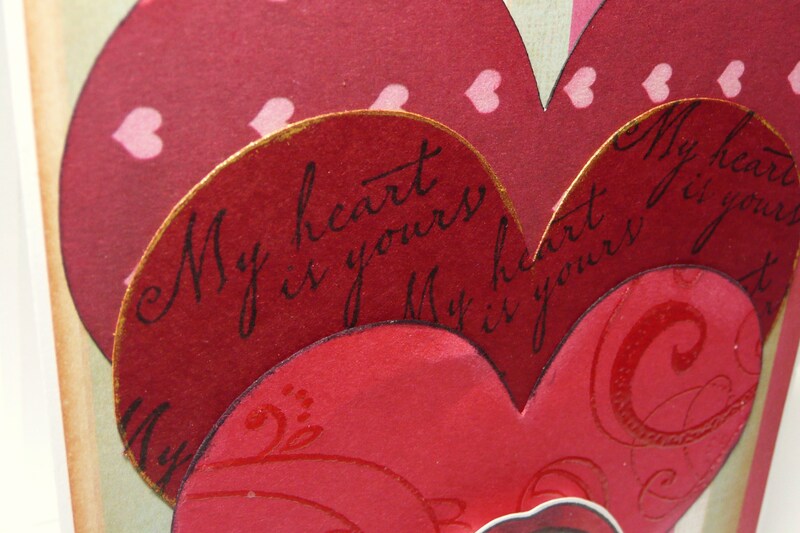 The card below is the Valentine’s card I made for Kris. 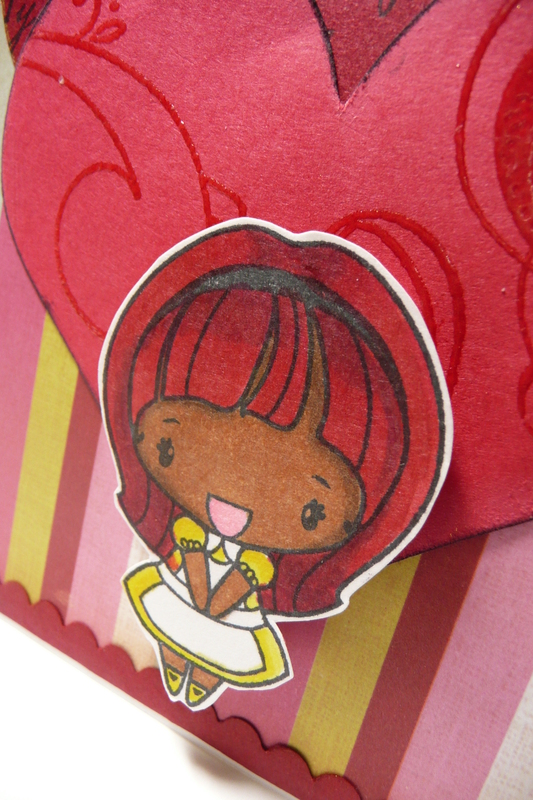 To make this card I used my Cricut, Create A Critter and Everyday Paper Dolls cartridges. To embellish the card I used, my Swiss Dots embossing folder, chalks, Vintage Photo Distress Ink, Copic markers, cotton and hemp cord. 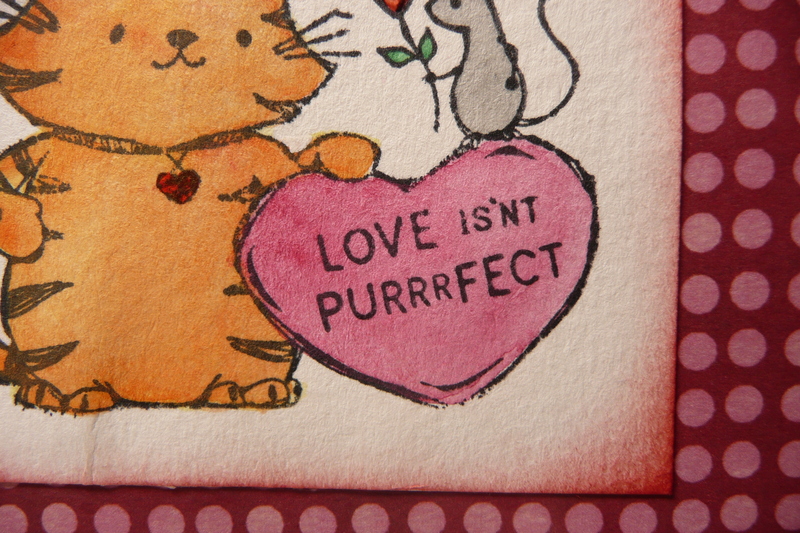 The stamped sentiment is from the Be Mine set from Pink By Design. Be sure to check out Sarah’s stamps, they are awesome and this set is perfect for anytime of the year. I really love this card and so did Kris!! I hope you love it too! I love the campfire from Create-A-Critter. He's just so cute! Smokin hot marshmallows! I used cotton to create the look of smoke. Thanks for taking the time to look at my card and for leaving me such sweet comments! Your comments always bring a smile to my face and I am so grateful for all your support. 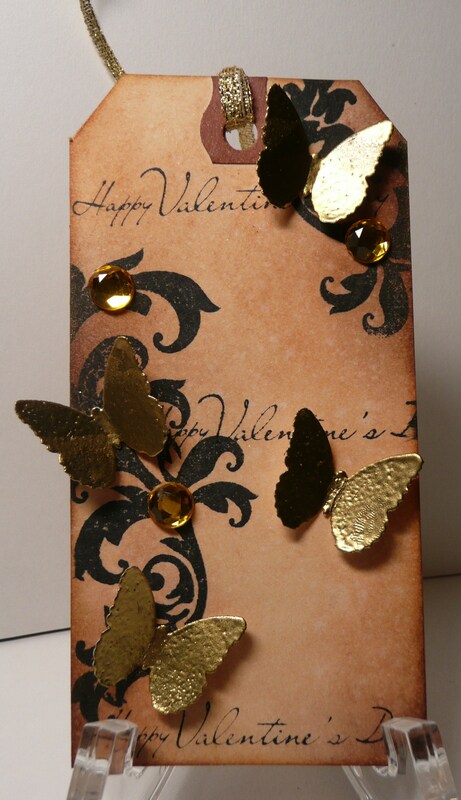 If you would like to see a detailed description of how I made this card please click here to watch my YouTube video. Don’t forget to follow my blog using one or both options in the side bar. Have a great Monday! 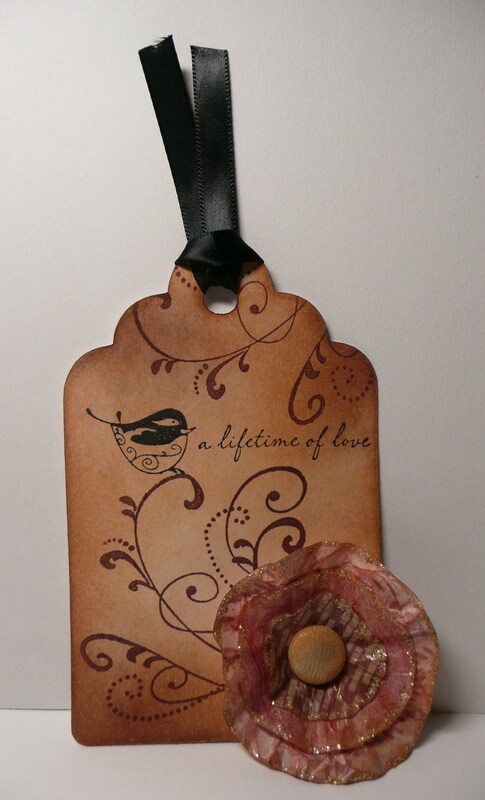 Here are my romantic and vintage Valentine tags. I’m really happy with how they turned out. Click here to checkout the video if you’d like to know what supplies I used to make them. 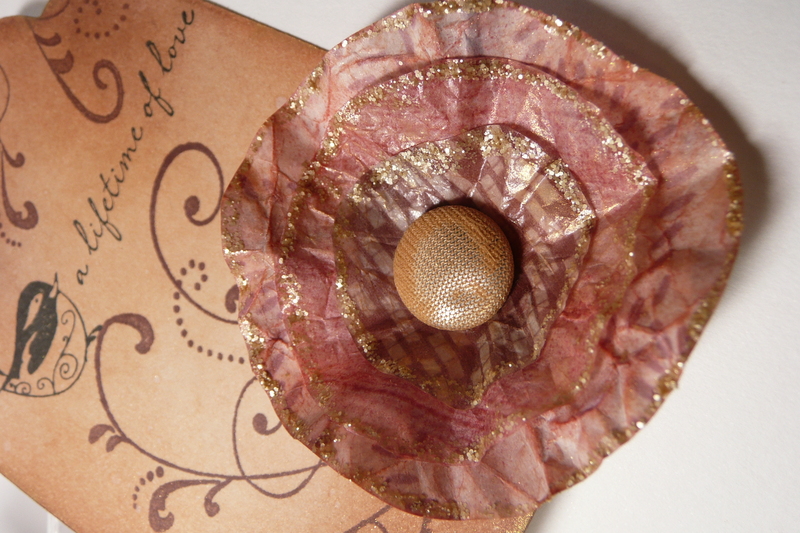 Lollipop flower with antique button center. The flower is edged with Antique Linen Distress Stickles. 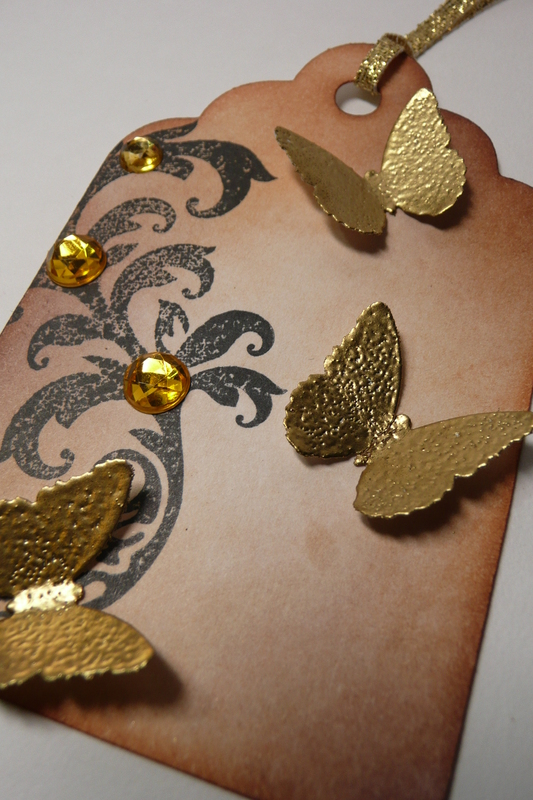 Edged with gold pigment ink and misted with homemade Perfect Pearls mist in Perfect Gold. 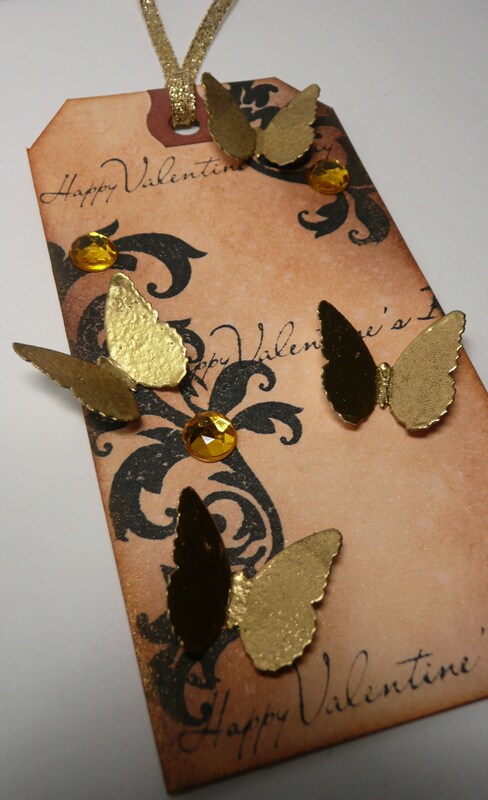 Close up of embossed butterflies and gems. Close up of Perfect Pearls mist in Perfect Gold. 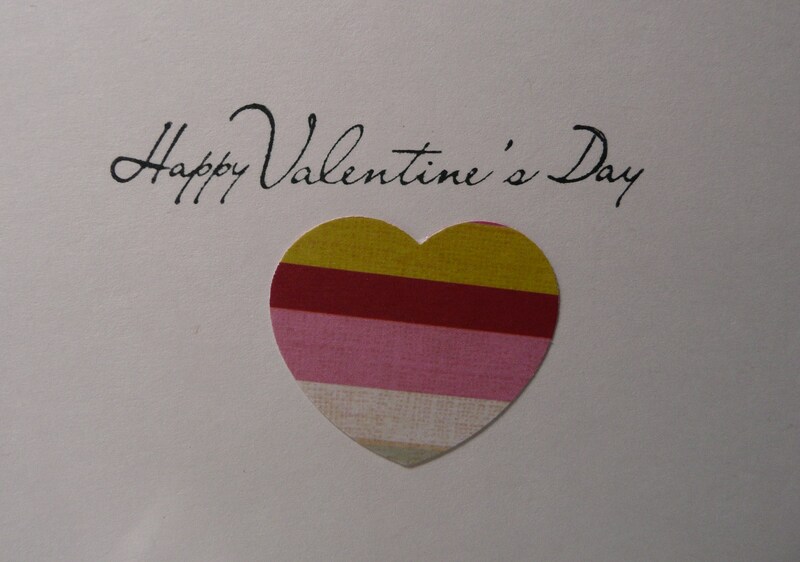 This cute little Valentine card was made using a Valentine $1 stamp from Inkadinkado. The image was stamped on watercolor paper using Staz-On ink and colored with watercolor pencils. Then it was distressed with Fire Brick distress ink. 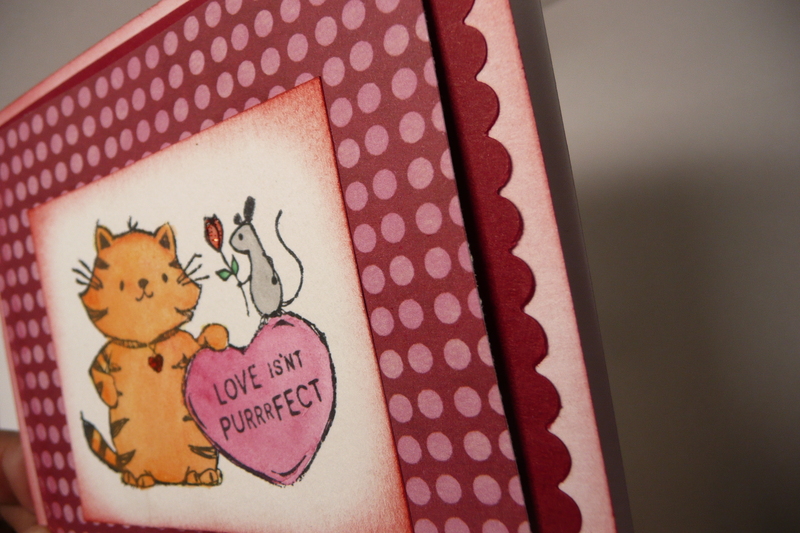 The patterned paper is from K & Company’s Lovely collection. 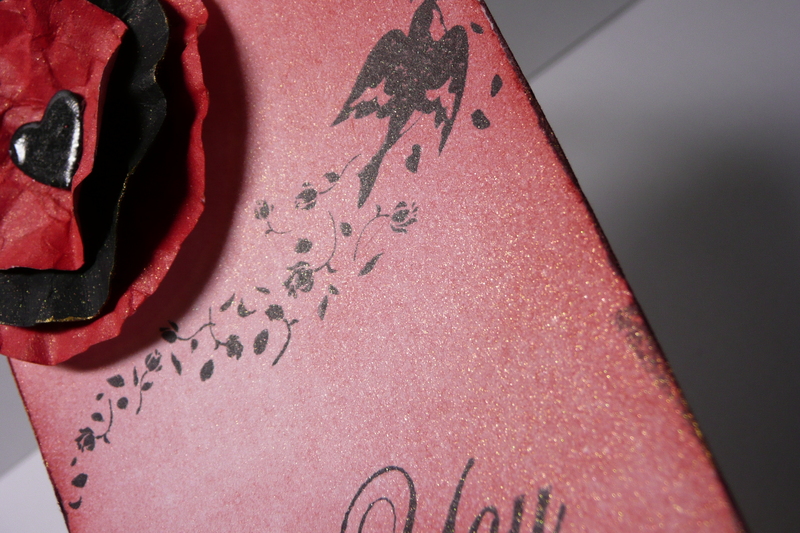 The dark red solid card stock is from Recollections. I edged the right side with Creative Memories scallop scissors. The card base is white Georgia Pacific card stock, distressed with Fire Brick distress ink. Inside sentiment is from Inkadinkado. 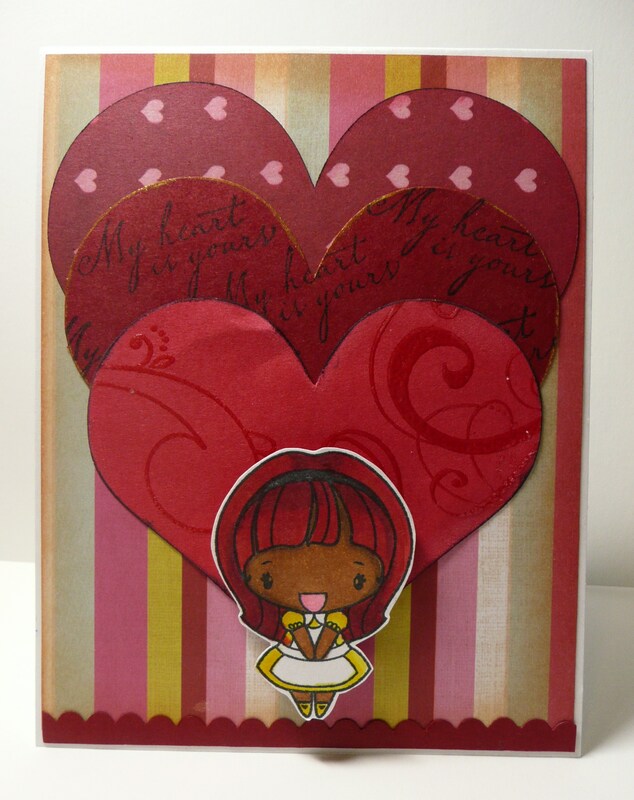 The hearts are punched out from the Lovely paper collection using the Creative Memories heart punch. To see a video of this card just click the link after the photos. Thanks so much for stoppin’ by! 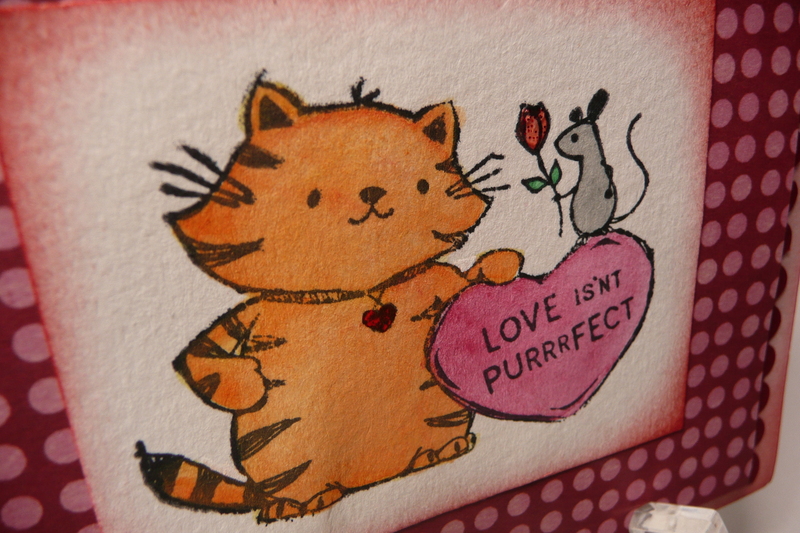 Click here to watch my Love Isn’t Purrrfect video over at youtube! 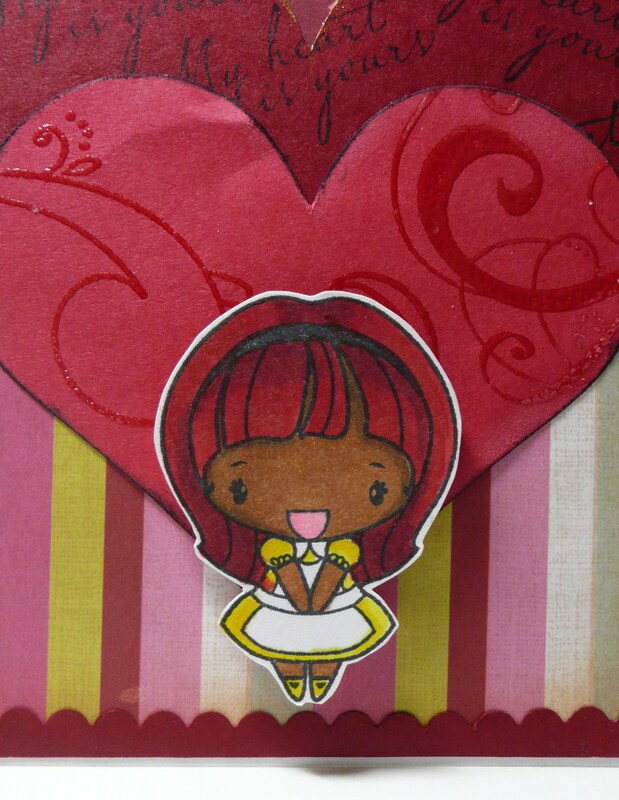 I just love this sweet & adorable Valentine’s card. The stamped image was colored with Copic markers. I got a set for Christmas and have been practicing with them. They are gorgeous markers and are so fun to color with. I also really love The Greeting farm stamps. They are so adorable and such wonderful quality stamps. Anya stamped image – The Greeting Farm, Signature. Stamped with memento ink in tuxedo black, Colored with Copic markers. Hearts – Plantin Schoolbook cartridge, cut at 3 1/4″, 3 1/2″ & 4″. 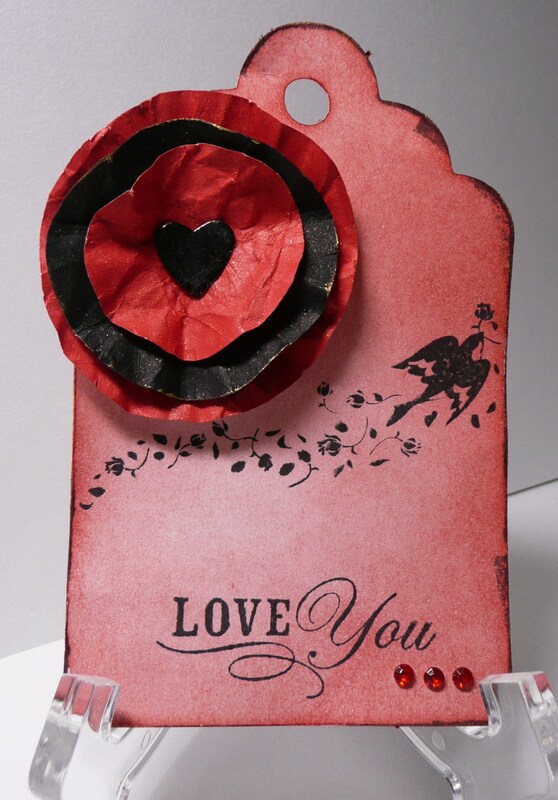 Light and dark red paper are from Recollections, Heart patterned paper is from K & Company, Lovely collection. 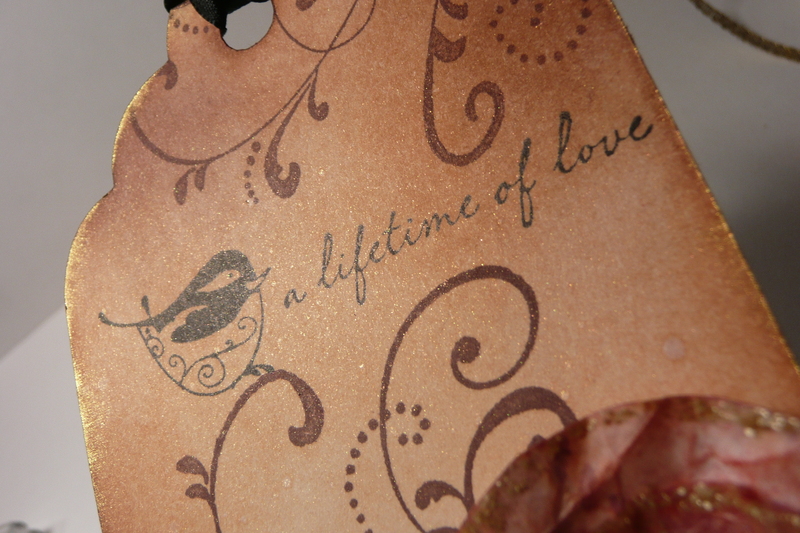 3 1/4″ heart was stamped with Swirls stamp from Autumn Leaves and embossed with clear embossing powder. Background paper – K & Company, Lovely collection. The edges are distressed with Tea Dye distress ink. Scallop bottom border – Recollections paper and Creative Memories scallop scissors. 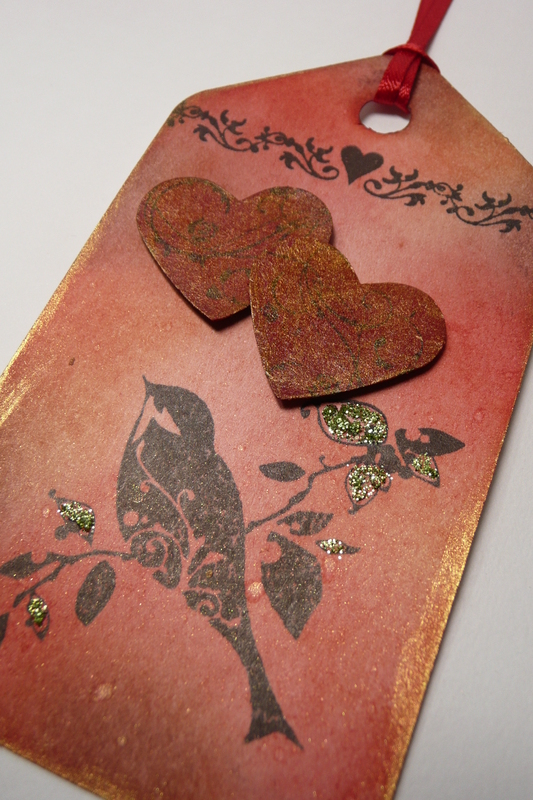 Sentiment - Studio g. Hearts edges with black and gold pigment ink.